2005 Jaguar XKR Supercharged Convertible. Finished in Pacific Blue with Ivory Recaro Leather Seats. This late 2005 model has some subtle upgrades from the standard car including: Full recaro Sports Seats finished in Ivory, BBS Montreal Alloy Wheels, Brembo Brakes, Jaguar Telephone and Sim Card, Adaptive Cruise Control, Operational Sat Nav System along with 2x keys and remote fobs. 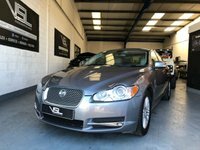 This superb 4,2 V8 Supercharged Jaguar has a very comprehensive history file backing up the mileage and provenance with the relevant invoices enclosed. The car drives very well and has a soundtrack that the enthusiast will appreciate from the stainless steel exhaust that really does stir the emotion that only a Jaguar designed by the Special Vehicle Operations Department of the factory can. 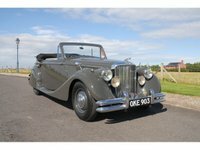 The car will be serviced and delivered with a new MOT test prior to delivery to its next custodian. Cars like this are few and far between and this car especially represents fantastic value for money for a 400bhp modern classic.